Dork Diaries fans! There’s a new queen of comic strips, and her name is Raina Telgemeier. This tale of teen life has us grinning from ear to ear. It’s a New York Times bestseller and it’s scooping up awards all over the place. Enough to make any author smile. If you think middle school is tough enough already, it’s even worse for Raina! She trips over and busts her mouth to bits. Now she’s stuck in the biggest brace on Earth. There’s surgery, a headpiece and false teeth. Plus a major earthquake, best friends and a cute boy. 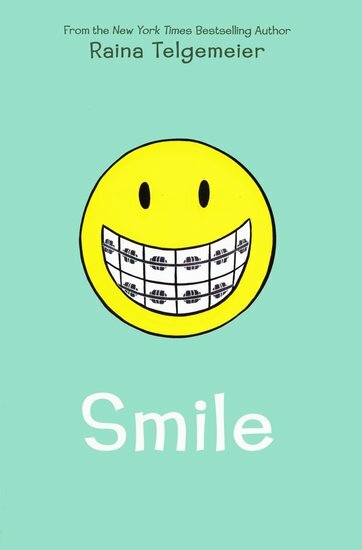 Think the Wimpy Kid meets Judy Blume… at the dentist! Awesome things The Author Smile The artwork The characters I love graphic novels. When I first came across this, I thought that it was going to be another dramatic, sad, story or something like that. But no! This book is amazing recommend for all ages! Adults and kids alike will appreciate I appreciate and admire this wonderful Book! 5 Stars!